The year 2014 will be the year in the WWE we will remember as the year The Undertakers WrestleMania Streak ended, or it could be for when Daniel Bryan main-evented WrestleMania or for the year the WWE Network was born! 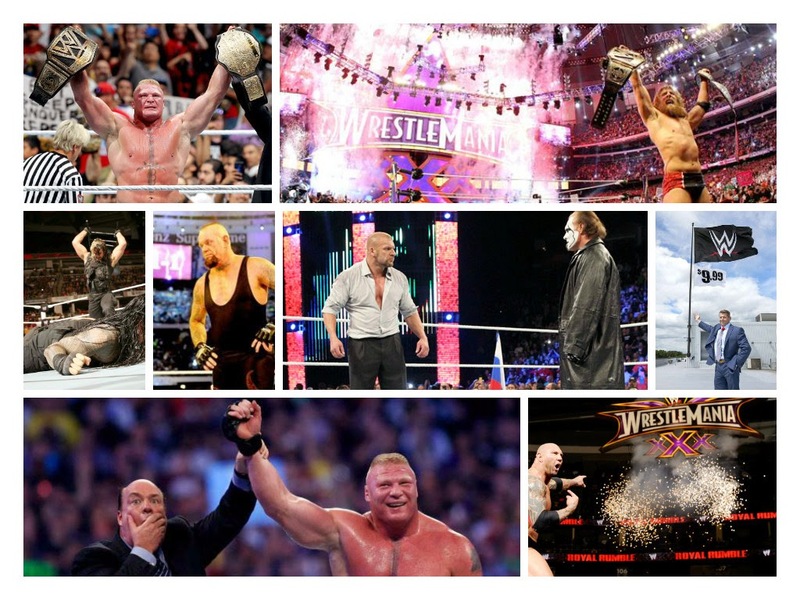 2014 was quite a year for the WWE. The company released it's latest design, it's over the top WWE Network! It has been tough for the company though with the Network, the UK are still waiting on it and getting enough subscribers is a real mission as well for the Network. But I feel confident that the WWE Network will be a huge success for the WWE. Also NXT became a much more bigger and popular show within the WWE. 'The Superstars of tomorrow' is what NXT is all about. Names like Adrian Neville, Sami Zayn, Tyler Breeze and the incredible tag team The Ascension are what helped make 2014 a great year for NXT. And NXT can only continue to grow even more throughout 2015. A lot happened in the year 2014 for the WWE and I break it up month by month to show you what went down this year and at the end I will give my ideal Slammy Awards. Dave 'The Animal' Batista returned to the WWE on 20/1/14 and he vowed that he would win the Royal Rumble and main-event WrestleMania and boy was he right. Fast forward to the Royal Rumble and Batista did indeed win what was a mediocre Royal Rumble match. The WWE fans were not happy one bit. Also during the first month of the year, Randy Orton's WWE World Heavy Weight Championship reign was continuing on as he battled John Cena at the Rumble in a decent contest in which we saw The Wyatt Family cost Cena the match up. Bray Wyatt himself was involved in a very personal rivalry with Daniel Bryan which even involved Bryan joining the stable for a week. Wyatt and Bryan would face off in an epic clash at The Royal Rumble which is still to this day one of both of the mens best matches to date in the WWE! The WWE Universe were treated to an absolute classic at the Elimination Chamber when we saw The Shield face The Wyatt Family for the first time ever. The rivalry building up to the huge match up was awesome as we saw intense moments between both groups each week throughout Raw & Smackdown. The match up was by far one of 2014's best matches and it was exactly what the WWE Universe would chant 'this is awesome'. Randy Orton had tough challenge as he was set to defend his World Championship inside the Elimination Chamber. He would face each other competitor for the match up during the weeks before the PPV event. Some real good matches produced were Orton v Cesaro and Orton v Daniel Bryan. And then Cesaro took on John Cena in an awesome match up on the 17th Feb edition of Raw, believe me that match is a must watch! Randy would go on to successfully defend his championship though inside the chamber with a little bit of help from Kane. So both Orton and Batista were both building huge momentum towards the 30th annual WrestleMania. With WrestleMania just around the corner, the month of March was all building up towards the biggest wrestling event of the year. Hulk Hogan returned to the WWE and he was announced as the guest host of WrestleMania. Hogan would go onto announce that at Mania there would be an over the top battle royal in memory of the late great Andre The Giant. Also we had John Cena and Bray Wyatts rivalry building up, involving Wyatt trying to get Cena to join the family. 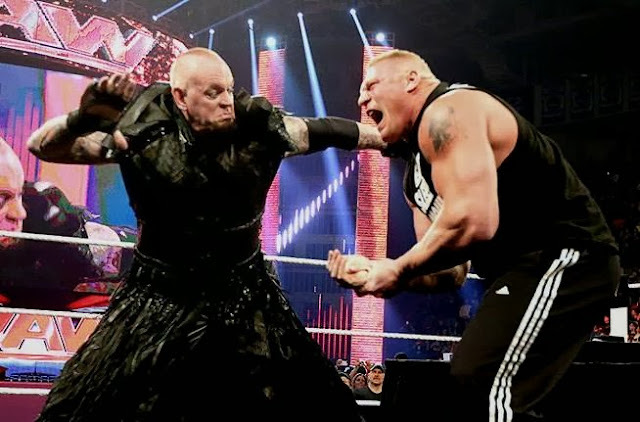 We had the return of the Undertaker whom challenged Brock Lesnar to a match at WrestleMania. And of course we had the rivalry building up between Daniel Bryan and The Authority and Randy Orton and Batista. Daniel Bryan even went onto 'occupy Raw' on the 10th March edition of Raw. Bryan would get around 100+ fans to surround the ring and make Triple H make their match at WrestleMania official and that if Bryan won he would go onto to compete for the WWE World Championship in the main-event of WrestleMania as well! But I think the one thing everyone will remember about WrestleMania 30 was that Brock Lesnar went on to end The Undertakers undefeated WrestleMania streak. Nobody saw it coming at all! The night after WrestleMania on Raw was a big one though as we had The Shield take out Triple H and we saw the debut of Paige in which she beat AJ Lee for the Divas Championship. Also we saw Evolution reform and a rivalry between The Shield would begin. The month of May included the Extreme Rules PPV. We had three big main-event matches taking place at the event. John Cena and Bray Wyatts rivalry was continuing and Wyatt was getting an audience to 'follow the buzzards' much to Cena's dismay. They're match at Extreme Rules took place inside a steel cage, the match was what it was. It went on the to long I found and the ending really made Bray Wyatt look weak. Daniel Bryan and Kane were involved in a very personal rivalry for the World Championship. Kane was stalking and near enough attacking Bryans real life wife Brie Bella. They had an extreme rules match at the PPV event. It was a fun match which even involved Kane going through a burning table to finish of the match, give credit to WWE there being a PG company and using a spot like that was very good. The Shield and Evolutions rivalry was very intense week in and week out. The match they had at Extreme Rules was incredible to say the least. The Shield won that battle but the war was far from over! Bad News Barrett, Rusev and Cesaro all got big wins at Extreme Rules and each were moving higher up in the midcard position. Payback went down as soon as the month started as on the 1st June WWE's next PPV went down. Two huge rivalries would come to a close and some were just starting. Brie Bella slapped Stephanie McMahon and quit the WWE much to the shock of the WWE Universe. Also Sheamus and Cesaro had an awesome match for the pvv opener for the U.S Title. John Cena and Bray Wyatts crazy rivalry came to an end in an incredible last man standing match. The match featured tables, stairs, chairs and security walls breaking, it was brutal. Cena delivered us one of his best performances ever in the WWE as he left as the last man standing. Evolution and The Shield had another awesome match at Payback which was full incredible spots and brutality. The next night on Raw though was when things really shook up in the WWE... Batista quit and Seth Rollins turned on Roman Reigns and Dean Ambrose in an complete shocker. Seth went on to join The Authority and he has never looked back since. Two PPVs took place in the month of June and the next one was Money In The Bank. With Daniel Bryan being forced to vacant the World Championship due to having to undergo surgery the World Championship was up for the grabs in all star ladder match line up. Cena went onto to win the Championship that night and he became a 15 time World Champion (2nd most in history). Then the yearly traditional Money In The Bank ladder match took place, with Ambrose and Rollins both giving great performances in that contest. Rollins would win the briefcase with a slight bit of help from Kane. Also during the month names such as Rusev and Stardust were gaining big victories and The Usos were still dominating the tag team title picture. July featured a few returns to the WWE. Chris Jericho and The Miz both cme back to the company. Jericho was attacked by The Wyatt Family during his return and then a match between the two was announced for Battle Ground. AJ Lee also returned and on that night she beat Paige to win the Divas Championship back. At Battle Ground we witnessed an absolute classic 2 out of 3 falls tag team contest for the tag team titles. The Usos beat Luke Harper and Erick Rowan in one of the best matches of the year. AJ Lee and Paige had a good contest for the Divas Championsip and Jericho and Wyatt competed in a hard fought battle which Jericho won . The Miz won a battle royal to win the vacant I.C Championship after Barrett got injured and was forced to vacant the Championship. Seth Rollins and Dean Ambroses rivalry was building up week after week with both men building serious momentum over the other. Then John Cena defended the World Championship at Battle Ground in a fatal four way against Randy Orton, Kane and Roman Reigns. Kane and Orton teamed throughout the whole contest near enough whilst Cena and Reigns were hitting each other with everything they had. Cena went onto retain the World Championship though in that match. Then the next night on Raw 'The Beast' Brock Lesnar returned and it was announced that at SummerSlam he would challenge Cena for the WWE World Championship. Heated rivalries were building up for WWE'S second biggest event of the year, SummerSlam. We had Dolph Ziggler challenging The Miz for the I.C Championship. It was a fun opener to the show and we had a new champ crowned in Ziggler. It was a great win for Ziggler considering throughout most of the year so far he had been stuck in terrible booking. Paige reclaimed her Divas Championship from AJ Lee, Bray Wyatt beat Chris Jericho and Roman Reigns got perhaps his biggest singles victory when he beat Randy Orton. And then Dean Ambrose and Seth Rollins finally had they're long awaited match, a lumberjack match which was very crazy. Rollins won that battle. Stephanie McMahon had her first match in many years in the WWE when she faced Brie Bella at SummerSlam. The match was a lot better than expected and Stephanie went onto win due to a bit of betrayal towards her sister from Nikki Bella. Brock Lesnar destroyed and I mean DESTROYED John Cena at SummerSlam. Sixteen! Sixteen! I mean sixteen german suplexes were delivered to Cena in that match. Lesnar won the WWE World Championship that night and he has not looked back since. Shortly after SummerSlam Seth Rollins and Dean Ambrose had an incredible street fight on Raw which closed the rivalry for a while as Rollins hit the curb stomp to Ambrose through a whole ton cinder blocks. The month of August gave us a lot of title changes and newer names really getting a great showing throughout the WWE. September kicked of with a bang as Chris Jericho and Bray Wyatts rivalry came to an end as they fought it out inside a steel cage. Jericho may have lost that battle but he did win the Extreme Moment of the Year with his huge crossbody dive of the top of the cage. Night Of Champions was the PPV event which took place in this month and like always every Championship was indeed on the line. Ziggler lost the I.C title to The Miz (but won it back the next night on Raw). AJ Lee won back the Divas Championship once again. Goldust and Stardust beat The Usos for the Tag Team titles in a great match. Sheamus and Cesaro had an even better match than they did at Payback for the U.S title. Also we saw Jericho and Orton give us a classic in which was Jerichos last match for a while. Dean Ambrose would also return as Roman Reigns unfortunately had to undergo surgery. Brock Lesnar faced John Cena for the World Championship at NOC. It was very different to the match they had at SummerSlam. Much more back and forth and not quite so many suplexes. Seth Rollins though would get involved and cost Cena the match up and the whole thing would end in DQ. Not really a great finish I thought, it made Lesnar look weak. Hell was awaiting the WWE Universe in October as the Hell In A Cell PPV was right around the corner. On the 6th October edition of Raw the crowd in the Barclays Centrer in Brooklyn were treated to what was a truly incredible moment. The Rock would return and interrupt Rusev and Lana. It was a great segment/moment which nobody saw coming. One of the highlights of the year for Raw without a doubt. Hell In A Cell had a stacked card with two huge matches. Matches for the event included a geat 2 out of 3 falls match between Cesaro and Ziggler for the I.C title. Ziggler won that great opener. The Usos failed to win back the tag team titles from Goldust and Stardust. AJ Lee beat Paige in the last match in they're great rivalry. Then we had John Cena face Randy Orton inside Hell In A Cell where the winner would become the number one contender for the World Championship. The match was awesome, I mean they really used the cell well, tables and chairs were used. It was up there for me as one of the best Cena v Orton matches to date! The main-event of Hell In A Cell was Dean Ambrose vs Seth Rollins in a Hell In A Cell match. This match reminded me of the older/earlier Hell In A Cell matches in the WWE. Both men fell halfway down the cell crashing through the announce tables. They were throwing so many weapons at one another inside the cell. It was incredible! WWE showed us that they can still be very extreme even when they are a PG company. Rollins won this match thanks to Bray Wyatt returning and attacking Ambrose. So October was a great month I found for the WWE. And November would give us something even more better! November 2014 will always be remembered as the month that Sting finally made his long awaited debut in the WWE. It was at Survivor Series that that historic moment occurred and time did indeed stand still. At Survivor Series we saw Team Cena battle Team Authority in a classic 5 on 5 traditional Survior Series elimination match. It was a match which showed betrayal from Team Cena member The Big Show. It showed us witness an incredible performance from one of WWE's most underrated stars, Dolph Ziggler. And then of course it gave us Stings incredible debut which sent The Authority packing. We also saw Dean Ambrose and Bray Wyatts rivalry really heat up when they went toe to toe at Survivor Series. The match ended by DQ due to Wyatt giving Ambrose the oppurtunity to strike him with a steel chair. However there was much more carnage to follow after the match for Wyatt though. Also Nikki Bella became the new Divas Champion and Miz and Mizdow won the tag team titles. Also in the month of November we saw The Wyatt Family go they're separate ways as Luke Harper beat Doph Ziggler for the I.C tile and Erick Rowan would start a rivalry with Big Show shortly after Survivor Series. The final month of the year in the WWE sure is a big one... its all about The Slammy Awards and a bit of TLC. The Slammys gave us some great winners this year in the WWE. Match of the year went to Team Cena v Team Authority at Survivor Series. Diva of the year went to the deserving AJ Lee. Tag team of the year went to The Usos. And Super Star of the year went to Roman Reigns. The Slammys are always a great show which WWE put on every year and 2014 was no different. TLC was a very mixed PPV for a lot of fans. Some didn't seem to like it while others thought that it could have been better and some thought it was a great show. I thought it was a decnt show which could have been better though. The main match which we will all remember was the epic ladder match for the I.C title where we saw Luke Harper defending against Dolph Ziggler. Incredible match from start to finish, Ziggler got busted open and one point and Harper nearly broke his arm (literally). Ziggler would win back the I.C title that night. Dean Ambroe and Bray Wyatt would face of in a pinfall/submission TLC match. It was a good match but I will admit it did get a bit repetitive and the finish was terrible, I mean what were WWE thinking? Wyatt would win that match. Other hightlights included Rollins v Cena in a tables match which Cena won and then Roman Reigns would make his big return to the WWE. And then there was a chairs match between Ryback and Kane.in which Ryback won. On the last few Raws of the year we saw big names like Chris Jericho and Edge and Christian return to host Raw for the night. Highlights included Brock Lesnar returning and attacking John Cena after a very hard fought cage match against Seth Rollins. And on the 29th December edition of Raw, Daniel Bryan would return and announce that he will return at the 2015 Royal Rumble match! December gave us the returns of many Superstars past and present. And heated rivalries still waged on throughout the month. PPV Of The Year: WrestleMania 30- A truly classic/memorable WrestleMania. Two incredible matches and many incredible moments to follow. Diva Of The Year: Paige- She debuted he night after WrestleMania and won the Divas Championship. She had an incredible rivalry with AJ Lee and 2015 will only be a bigger year for Paige as well. Match Of The Year: Daniel Bryan v Randy Orton v Batista WrestleMania 30 and Adrian Neville v Sami Zayn NXT Revolution- Two incredible macthes that had to both win this award for me. Both were emotional and awesome matches which we the WWE Universe will never forget. Superstar Of The Year: Seth Rollins and Dean Ambrose- Both had incredible years. They were in The Shield until early June when Rollins betrayed his team-mates. Rollins would win Money In The Bank. They would both have a very personal and exciting rivalry with one-another which gave us three great matches. 2015 will be an even bigger year for these two! 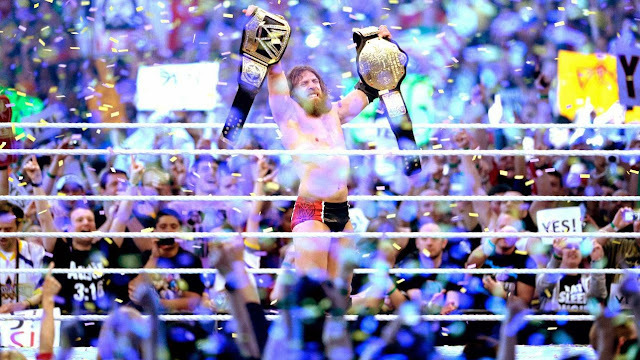 What will 2015 bring to the WWE? Will Brock Lesnar get beat for the WWE World Championship? Will we see The Undertaker return? Who will win the Royal Rumble? And of course how much bigger will the WWE Network get? 2015 is right around the corner WWE Universe! Reviewing the best of WWE in a phenomenal year.